(Bloomberg) -- Prime Minister Justin Trudeau delivers his fourth and final budget this week before Canada’s next election. The fiscal plan, to be unveiled Tuesday in the Ottawa legislature by Finance Minister Bill Morneau, comes with the economy in a soft patch, concerns building over the country’s competitiveness and the Liberal government trailing in opinion polls. Trudeau’s enhanced child benefit payments are his most important achievement. The program -– worth C$24 billion ($18 billion) in 2018 -- built upon one that had already been enhanced by the previous Conservative government. The Liberals made the benefits tax free and more-heavily skewed to lower-income families. It was considered smart macroeconomic policy when introduced soon after Trudeau’s election win, a shot in the arm for a struggling economy. Its social impact will be even more long-lasting: Since 2015, the number of children living in poverty has declined by 278,000. 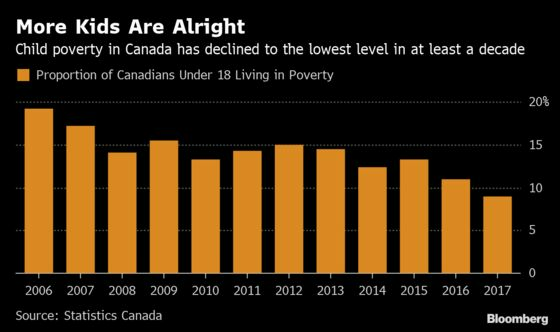 “It had a measurable impact on consumption, labor force participation and long term economic stability through a re-balancing of income distribution in Canada,” said Kevin Page, chief executive of the Institute of Fiscal Studies and Democracy. Trudeau also gets high marks on his handling of negotiations with the U.S. on the new North American free trade agreement and his steadfast support for open commerce in a world where protectionism is on the rise. Critics point out Canada still relies on the U.S. for most of its trade, while gains from an agreement with the European Union have been slow to materialize. Not to mention the North American deal has yet to be ratified, and American steel and aluminum tariffs are still in place. A feud with China after the arrest of a Huawei Technologies Co. executive has also clouded the outlook for Canada’s fastest growing export market. 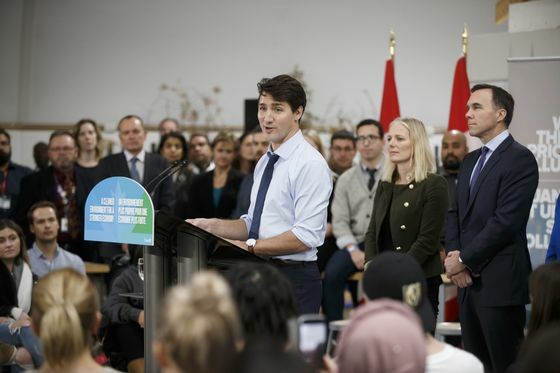 Trudeau earned kudos for breaking with conventional wisdom to embark on a program of deficit spending, and for his efforts to do more on infrastructure. Yet most see the deficits as unnecessarily large. Others worry the government has toyed so much with its fiscal anchor, it no longer has credibility. Finance ministry projections show Trudeau, if re-elected, will accumulate C$133 billion in deficits between 2016 and 2023, versus a campaign pledge of no more than C$25 billion. The prime minister’s strategy of promoting immigration to bolster the economy and grow the labor force won him praise. The country took in 425,000 people in the 12 months through September, boosting population growth to 1.4 percent, a three-decade high and the fastest pace in the Group of Seven. This dovetails with efforts to increase diversity, part of a plan to get more women and lower income people working. Growing the labor force and employment may have been the Liberal government’s greatest success. However, other measures weren’t as well received. The decision to raise the marginal income tax rate for high income earners could undermine the country’s ability to attract new talent and was widely panned by economists. So was Trudeau’s move to lower the eligibility age for old age benefits. There was never a clear path to success, and the Liberals haven’t done any worse than the previous Conservative government in getting the nation’s oil to market. But many analysts believe the pipeline situation has deteriorated. Under Trudeau’s watch, two major pipeline options are off the table, and the government was forced to nationalize the only one that remained. There’s also widespread concern the government’s new environmental assessment legislation will do even more damage. On the other hand, the government’s efforts to tackle climate change through carbon pricing are winning support. With the energy sector now faltering, the overriding opinion is the country’s competitiveness likely worsened under the current government. The government earns praise for taking steps to match U.S. corporate tax cuts late last year, but some say it waited too long -- which caused a spending freeze. Business investment in the final three months of 2018 was 22 percent below record high levels in 2014. While economists list myriad reasons for the country’s poor productivity picture -- most predating the Liberals -- they say Trudeau hasn’t given it sufficient attention. And the data isn’t pretty: The economy recorded zero productivity growth last year. “The Liberals may well point to their jobs record, but the real litmus test is productivity growth which has virtually stagnated since the 2015 election,’’ said David Rosenberg, chief economist at Gluskin Sheff + Associates Inc.